Calling this number will put you in touch with an operator who will collect the personal data necessary for order completion. The phone order service is active Monday through Friday from 9.00am to 12.00pm and from 2pm to 6pm. Shipment: postal package or express courier. Retailers or wholesalers: conditions are to be agreed on. 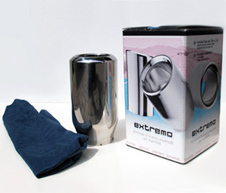 Your Extremo tailpipe will be delivered in an elegant protective case, wrapped in a dedicated dustproof bag. Inside the package you will find the mounting kit with screws and key for fast and easy mounting on the silencer tailpipe.